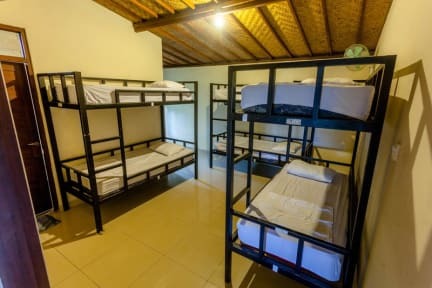 In Da Lodge offers 6 mixed dorm rooms, 2 standard double rooms and for the group-travelers there are 4 big family rooms. In Da Lodge is very close to the center, the monkey forest, temples, museums, shops, restaurants and so on. there is plenty of choice from the menu for our hungry traveler. In Da Lodge also offers BBQ packets you can grill on the BBQ all for very reasonable prices. It's at an amazing location, facilities for the price you pay are top class. Swimming pool, massage tables, sit out areas, in house bar and kitchen you name it and you have it. Prices of Beer, Food, Bike rentals etc are much much cheaper than outside market. 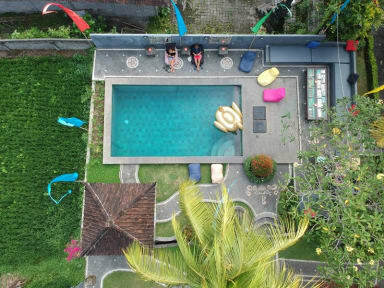 I made some fabulous friends from different parts of the world and time spent at this hostel was the best during my entire Bali tour. I'm surely gonna stay here when I come back to Bali. I have stayed here three times, the first I extended my stay & the third time was to come back on a spare day. Love this hostel, the staff are great, helped organise trips to Nusa Lembongan & the airport. Handy location away from the centre of Ubud but only an extra 3/4 minutes walk from everything. Excellent time here. Great place to stay. Very near the main areas in Ubud, but still far enough to escape the hustle and bustle. May only be me but I found the staff to be unapproachable and not the friendliest; they do a great job accommodating you just not the type of staff to have a convo with. Big property and clean. Cool vibe and alot of chill backpackers. Highly recommended! No complaints for the price. Not much atmosphere despite the size but still a good place to stay for a few nights. The place is great, the location in the center and at the same time seams like you are in a retriet. However, although it was really cheap, wouldnt be two hard for the employes to be nicer. Several Times i asked for recommendation and the only thing they were worried about was selling more or get me a táxi. The worst was without a doubt the bed. It looked like sand that swolled me. Really really bad, even for the price i paid. Just came to a new hostel and was received by my name. Good facilities, but is not clean, I'm looking for the place to stay during my travel, can't imagine sleep with 20+ people in the same room, and so messy, prefer 8max dormitory, tour are more expensive than outside. £3 a night? Wouldn’t stay here for free. Awful. Cleanliness, well I don’t think they even cleaned the place. There is no aircon and only one fan per room and the rooms are huge. The hostel is literally open for anybody to walk in to - no lockers available either. Myself and another traveller lasted 20 minutes. I got bed bugs here. I didn’t know what it was at first, I thought I was having an allergic reaction to the mosquitos there but it was definitely bed bugs. Honestly it’s 2 dollars but this place is just gross. I’ve stayed in a lot of hostels and by no means need a super clean place but I just felt so dirty here even after I showered I couldn’t wait to leave. Also yea I got bed bugs that should be enough.